Welcome to my stop on the bloghop- you should have come from Shannon McComb’s blog! I’m the very very last….maybe the very very nearly best? I can say that since I’m typing this before my post goes live….I’m betting by knowing the names ahead of me, there’s tons of talent in this hop! The Human Rainbow is my little initiative here on the interwebs to get a little diversity out there into crafty land. 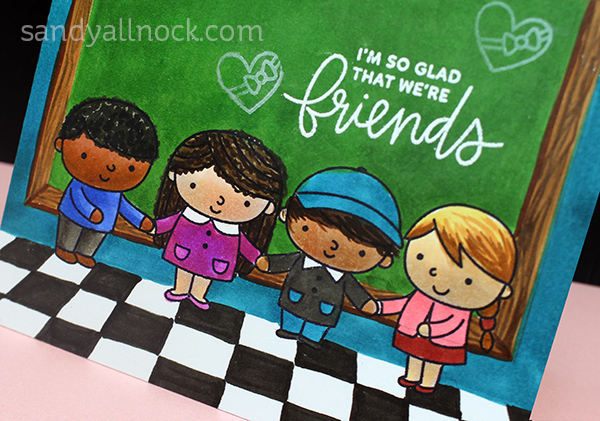 Today’s card celebrates the variety of kiddos – in a school! 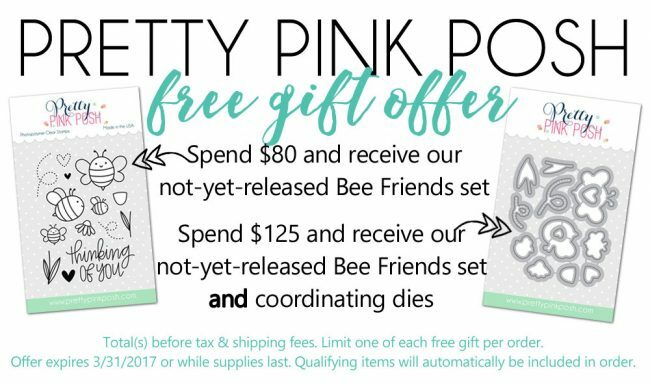 I’m using Friends Forever….love these cute little peeps!Watch the video below or click HERE to see it in HD on YouTube. It doesn’t have to be hard to set a “scene” – a simple brown frame filled with green makes an easy chalkboard! PRIZES! There are 4 $25 gift certificates up for grabs (two winners each day, yesterday + today). Winners will be picked randomly along the blog hop. Comments must be left by 11:59 PM PST on 3/17/2017. Winners will be announced on the PPP blog. These are the amazing talents in the hop….be sure to go visit each one! Be sure to come back tomorrow for a visit….it’s Watercolor Weekend, and I’ve got some treats for you! Including a LIVE broadcast on YouTube on Sunday at 1pm. Well, if I can figure out how. LOL. Coz, technology is a thing. Bring your watercolor questions! thanks for the video, love the floor! I like the diversity of the school kids! A very adorable card! Wow! I love the chalkboard. Very clever! Thanks for sharing! Great card and great release from PPP! Love your saturated colors! Wonderful card as usual. Love the checkered floor. Great release from PPP. I am so happy to see this diversity in your card…I have started colouring some of my people images from different cultures especially if I’m sending it to friends or card drives. I love your card. So fun. I love that tile floor! So fun! Adorable card. As always you make it look so easy! Love your coloring! It’s so awesome!! I never get tired of your coloring and additional embellishments that you do to the stamped images. So cute! Your coloring always amazes me. Some day I Willis try them!